I can’t believe it’s nearly Christmas! How exciting! Todays quick and easy recipe is for Mini Meringue Ice Cream Sundaes – a totally simple and completely delicious alternative to a traditional pavlova on Christmas Day… and best of all, it will only take 2 minutes to whip these babies up (seriously!). I know there are lots of people out there who LOVE the meringue part of pavlova but don’t really like cream (yep I’m one of those people!). 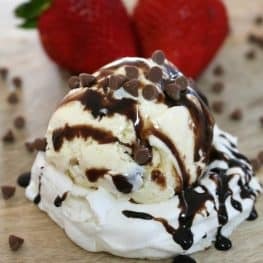 So these Mini Meringue Ice Cream Sundaes are just perfect because you still get to have all of the yumminess of the meringue, but without the heaviness of the whipped cream. They’re also a great idea if the weather is hot on Christmas Day. You can set this up like a little ice cream bar and let everyone serve themselves with all of the yummy toppings. 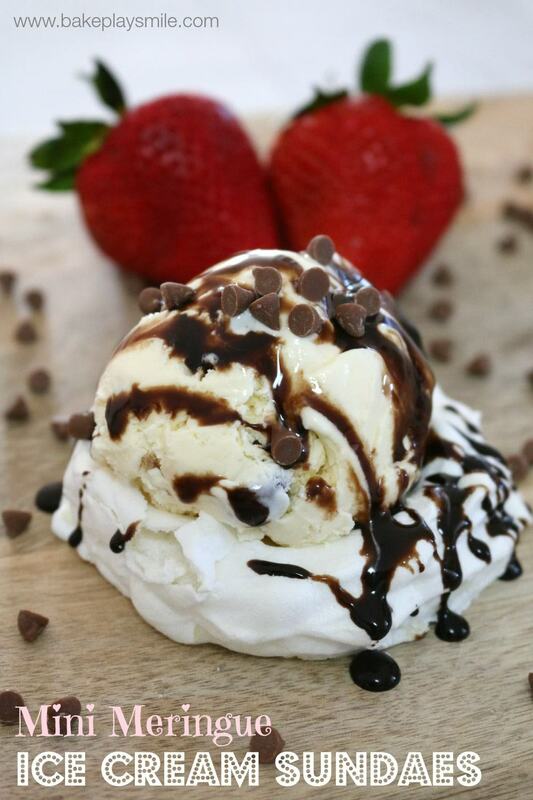 To make these Mini Meringue Ice Cream Sundaes you’ll need small meringue nests and some really yummy ice cream (I used a chocolate honeycomb variety). 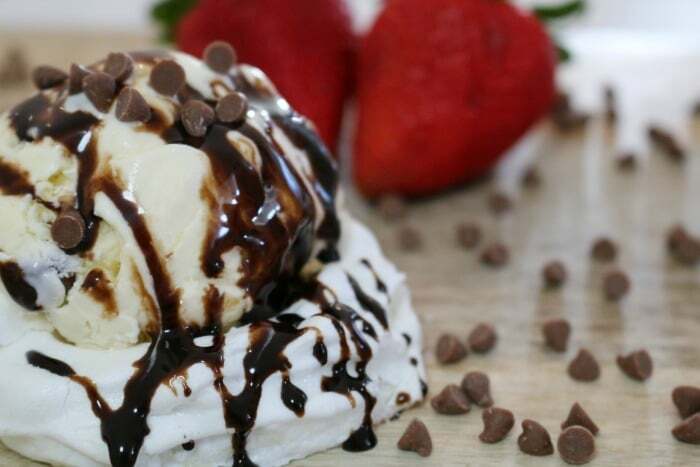 These two ingredients set the foundation for this dessert and then you can go as crazy as you like with sauces and toppings. 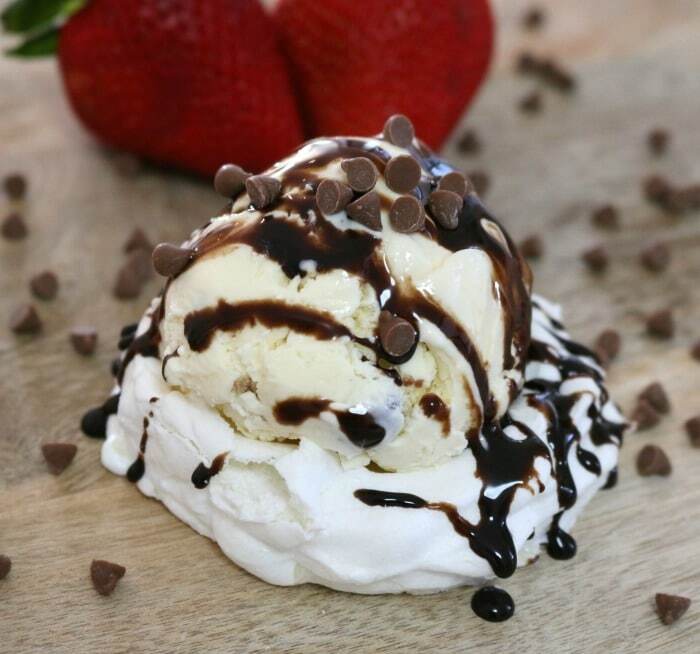 I used chocolate sauce, chocolate chips and sliced strawberries, but really, your imagination is the limit when it comes to this dessert! How about a hot caramel sauce with chopped honeycomb pieces? Or maybe a strawberry sauce with fresh berries? Or a rocky road version with chocolate sauce, chocolate chips, marshmallows and peanuts? 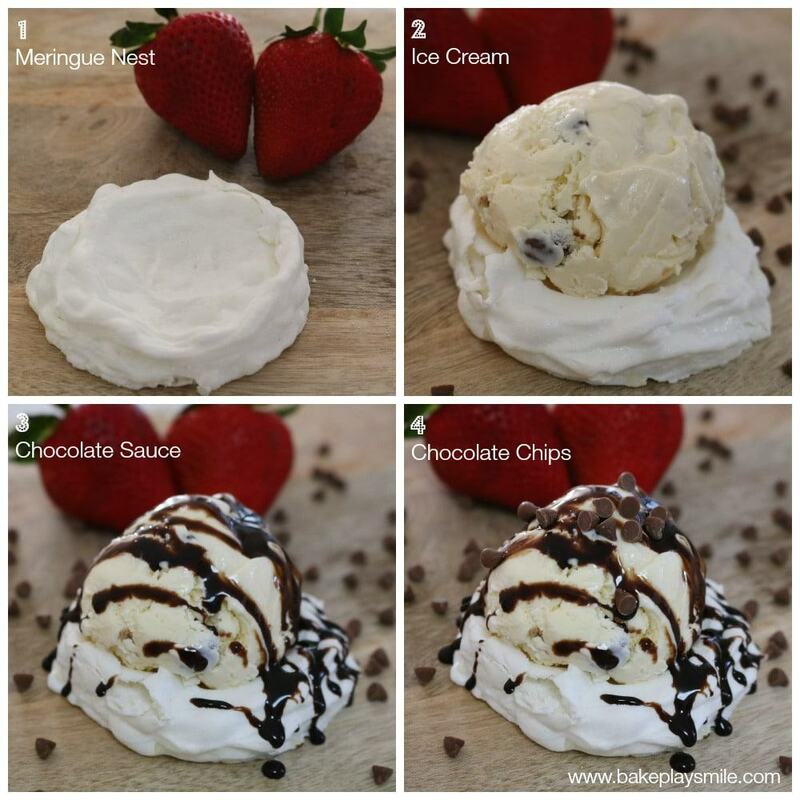 You know who else will absolutely love these Mini Meringue Ice Cream Sundaes? KIDS!! Oh my goodness, this is seriously the best idea for a Christmas dessert that kids will actually eat (and enjoy!). So don’t muck around spending hours on a Christmas pudding they’ll turn their nose up at, instead, set up the quickest, easiest and most ridiculously simple ice cream bar ever and you’ll be the most popular person in the world (minus Santa of course!). But, if you just can’t move away from the traditional pavlova with cream, then why not fill half of your meringue nests with the traditional cream and fruit toppings (or lemon curd!) and fill the other half with ice cream… that way everyone’s happy! How are you spending Christmas Day… and more importantly, what’s on your menu? The quickest, easiest and yummiest alternative to a traditional pavlova... these Mini Meringue Ice Cream Sundaes will keep even the fussiest of eaters happy! Place the meringue nests onto a plate. Top each nest with one scoop of ice-cream. Sprinkle with chocolate chips and decorate with sliced strawberries. So simple and so yummy! You had me at ice cream bar! We’re going to friends who are poms and are more trad than rad. There will be pud and pies (of the mince variety) but I’m taking some rocky road just to keep everyone sweet! What a great idea! I can see so many flavour combinations… Strawberry icecream and couli, macadamia icecream with caramel sauce, choc mint ice cream with choc sauce… Yum yum yum!